WesternU’s Master of Science in Pharmaceutical Sciences (MSPS) graduates are sought after in academia, the pharmaceutical industry, and both public and private research institutions. 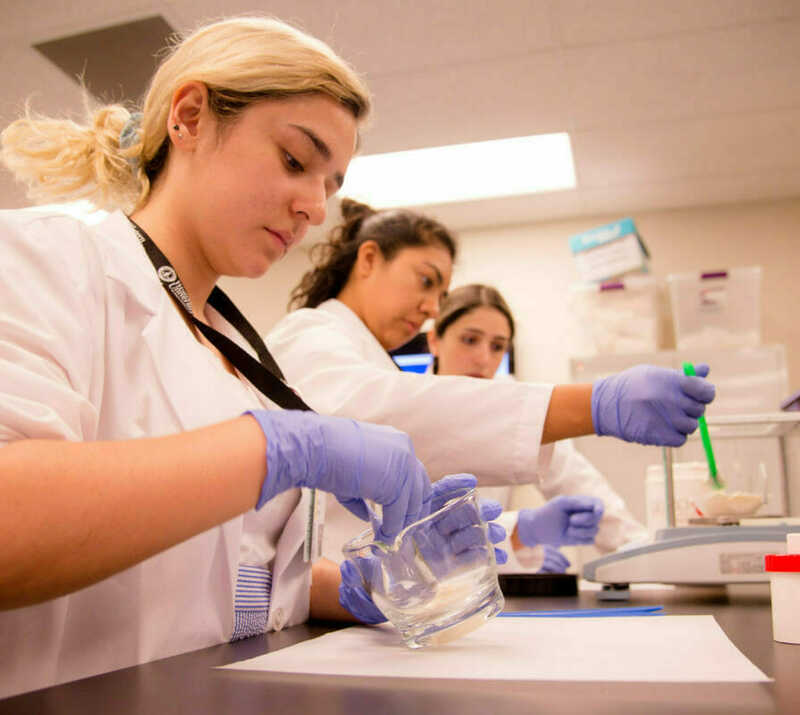 We attribute the success of our students to our students’ dedication, the curriculum, our faculty’s commitment to teaching and learning, and the College of Pharmacy’s emphasis on interdisciplinary research. During the two-year (full time) program you will complete core courses and electives in basic and applied sciences. You will also conduct independent research in the pharmaceutical sciences and complete a research-based thesis. A faculty advisor will help you select a research topic and mentor you throughout your thesis work. A minimum of 40 semester credit hours are required to complete the MSPS program. This typically includes 20 hours of didactic study and 20 hours of research leading toward the thesis. The WesternU Master of Science in Pharmaceutical Sciences (MSPS) will prepare you to ask salient questions in the pharmaceutical sciences and use your knowledge and research skills to find answers. You will become a creative scientific problem solver, whether you work in academia, the pharmaceutical industry, or public or private research. For more detail regarding the curriculum, please review the course descriptions (PDF) in our University catalog. Caring about students and helping them achieve success is a hallmark of our faculty. As respected practitioners and scholars who keep pace with the latest teaching techniques and technology, our professors are committed to helping you master the material. MSPS faculty are part of the Department of Pharmaceutical Sciences in the College of Pharmacy. Their areas of research include neuro-pharmacology, physiology, pharmaceutics and drug delivery, pharmacokinetics, genetics, environmental toxicology, and molecular immunology. Faculty research is funded through pharmaceutical companies as well as federal and private foundation grants. The Office of Learning Enhancement & Academic Development Office (LEAD) is another resource for on-campus and distance students. LEAD helps students connect academic success with wellbeing. In individual counseling sessions, students learn time management, test taking, and studying strategies. LEAD facilitates training in managing stress, increasing focus, and professional skills. WesternU is a thriving academic health center spread out over 22 acres in Pomona, CA. The main campus includes 19 major buildings. As a Pharmaceutical Sciences student you would primarily use classrooms in the Health Professions Center and 3,600 square feet of research laboratories in the University Research Center that include individual laboratories, cell culture and other facilities, a dark room, and a multi-species animal facility with the latest equipment to support faculty and student research. You will also make use of the Harriet K. and Philip Pumerantz Library, a four-story 34,000-square-foot building renovated in 2001. The library features hard-wire and wirelesscapabilities for laptop use in any room; group study rooms and numerous study carrels; and two computer labs. The library’s collection is extensive with over 27,000 volumes and journal subscriptions to over 500 print journals and access to more than 9,000 electronic journals. Electronic databases are available both on-campus and off-campus through the Library’s e-resourse page.